With back-end being split into microservices and front-end being monolithic, services we are building do not truly adhere to the idea that each should provide a full functionality. We are supposed to apply vertical decomposition and build small loosely coupled applications. However, in most cases we’re missing visual aspect inside those services. 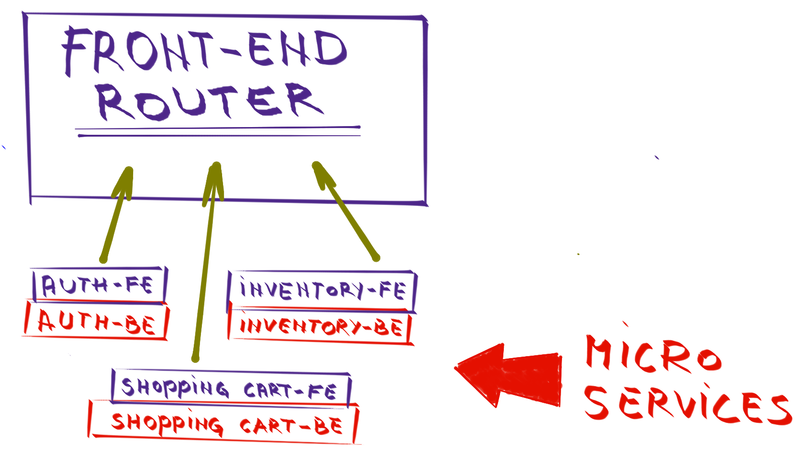 All front-end functionalities (authentication, inventory, shopping cart, etc) are part of a single application and communicate with back-end (most of the time through HTTP) that is split into microservices. This approach is a big advancement when compared with a single monolithic application. By keeping back-end services small, loosely coupled, designed for single purpose and easy to scale, some of the problems we had with monoliths become mitigated. While nothing is ideal and microservices have their own set of problems, finding production bugs, testing, understanding the code, changing framework or even language, isolation, responsibility and other things became easier to handle. The price we had to pay was deployment but that as well was greatly improved with containers (Docker and Rocket) and the concept of immutable servers. If we see the benefits microservices are providing with back-end, wouldn’t it be a step forward if we could apply those benefits to front-end as well and design microservices to be complete with not only back-end logic but also visual parts of our applications? Wouldn’t it be beneficial if a developer or a team could fully develop a feature and let someone else just import it to the application? If we could do business in that way, front-end (SPA or not) would be reduced to a scaffold that is in charge only of routing and deciding which services to import. 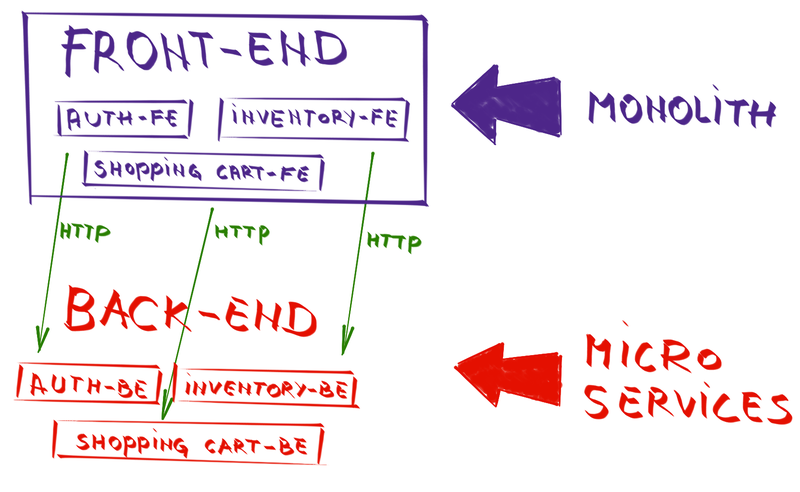 I’m not trying to say that no one is developing microservices in such a way that both front-end and back-end are part of it. I know that there are projects that do just that. However, I was not convinced that benefits of splitting front-end into parts and packing them together with back-end outweights downsides of such an approach. That is, until I discovered web components. Web components are a group of standards proposed as a W3C specification. They allow creation of reusable components that can be imported into Web applications. They are like widgets that can be imported into any Web page. With Custom Elements we can create our own custom HTML tags and elements. Each element can have its own scripts and CSS styles. The question that might arise is why do we need Custom Elements when the ability to create custom tags already exists? For a long time now we can create our own tags, apply CSS styles and add behaviors through scripts. If, for example, we would like to create a list of books, both with Custom Elements and custom tags we would end up with something like following. What web components bring to the table are, among other things, lifecycle callbacks. They allow us to define behaviors specific to the component we’re developing. createdCallback defines behavior that occurs when the component is registered. attachedCallback defines behavior that occurs when the component is inserted into the DOM. detachedCallback defines behavior that occurs when the element is removed from the DOM. HTML Imports are the packaging mechanism for web components. They are the way to tell DOM the location of a Web Component. In context of microservices, import can be a remote location of a service that contains the component we want to use. Web components provide a very elegant way to create pieces of front-end that can be imported into Web applications. Those pieces can be packaged into microservices together with back-end. That way, services we are building can be complete with both logic and visual representation packed together. If this approach is taken, front-end applications can be reduced to routing, making decisions which set of components to display and orchestration of events between different web components. Now that we are equipped with (very) basic information about web components and desire to try a new approach to develop microservices, we can start building a microservice with both front-end and back-end included. In the Developing Front-End Microservices With Polymer Web Components And Test-Driven Development series we’ll explore one of the ways to put discussion from this article into practice. We’ll use Polymer, Google library for creating web components, Docker, Docker Compose and few more tools and libraries. Development will be done using test-driven development (TDD) approach. The first article in the series is Developing Front-End Microservices With Polymer Web Components And Test-Driven Development (Part 1/5): The First Component. I see the additional complexity of sharding your html files. What benefit(s) do you think best justify the additional complexity? I think that the question should be answered in a much broader context of the approach to the whole architecture and not be limited only to front-end. It is the question whether to use microservices or monolithic applications in general. My stand is very much in favor of microservices. You’ll find many articles related to this question on this blog (for example https://technologyconversations.com/2015/11/03/microservices-when-the-stars-aligned/ ). If one chooses microservices as the overall approach to architecture, I think that Polymer provides a nice way to make them truly complete. That doesn’t really answer the question. Why bundle a portion of the html with the API? What benefit does this added complexity provide? The benefit is the same as with backend separation into services. Easier development, testing and deployment of separate parts of the application. If front-end is developed and packaged together, a single team can more effectivelly deliver the feature. Ofcourse, that (and microservices in general) makes sense if the system is big. If we’re talking about something smaller where the whole system is developed by a single team (lets say up to 8 people), this separation would be an overhead in many cases. I disagree.. This goes back to MFC in the 90’s. The low end developers can write 1/10 of the code that is executed, to do the same thing, Including MFC was overwhelming that amount of memory, CPU, and disk space.. Same goes here by including a ton of libraries that do 10 times what you need, just so you can process one portion of it; makes no sense. I put this in the same category has a new technology, means new mark on the resume. People are not learning to develop code anymore. They rely on 3rd party component to do the work for them. Developers these days are looking for an easy way out and when things break, they can have someone else to blame. This is why we need gigabit networks to process what we did back in the 90’s on a 10MB network. I feel sorry for the kids 30 years from now as it will need TB network connection in your home to hit Google’s home page, which could be done with 10 lines of code, but if you right click, view source, you will see 1000’s of lines and 2MB download. There is something to say about simplicity, but developers are building rockets to fly to the moon, just so they can drive something down the road. JavaSript was never intended to be the one all be all language. I work for a company that has us use WebFOCUS, which is a reporting tool. Next thing I know the business case is to use it to write full functioning web applications. Developers over use something, because it’s what they are use to. That in itself destroys the language. Thank you for the insightful article. Theortically, microservices emphasize on splitting the application vertically, but that works in my opinion for the back-end applications mainly for many reasons. First, up-to-date UI frameworks are not supportive of this architectural philosophy. Second, I don’t see any benefits of splitting them up — we will end up increasing the security risk and performance bottleneck. However, for SPA angularJS application, we can achieve the decomposability and reusability, but leaving the application monolithic as a whole. All programming languages offer some ways to decompose and reuse parts of the code. If it is enough to apply some rules and design patterns to avoid problems coused by monoliths why build microservices for the backend? Just apply those rules and forget about complexity of distributed systems. If think as far simple application are concerned you don’t need microservices for back-end and front-end. If we think about complex application (whole CRM domain for a bank or telco operator in example) microservices in the front-end is the only option. If your current front-end framework doesn’t support it change the framework. In our architecture, we treat the UI as a microservice that gets deployed independently of other components in the system. The UI is served out of an NGinx container and proxied by our API Gateway. This has worked out well for us. We find ourselves deploying the UI three times as much as other backend microservices. Plus, we can optimize calls by composing requests on the Gateway. This is one of the problems I see with associating UI components directly to microservices. I like the concept of a microservice providing a UI fragment, but in implementation, it seems the UI is better architected as a monolith. I completely agree to your last statement where you fragmented and ended saying UI being MONOLITHIC..
•UI should be treated as a client application. Do not couple UI to microservices or attempt to serve bits of your app from each miscroservices. I completely disagree. I would są that IT depend on size of UI. Small application that probably does not require microservices in back end should be monolithic. My last project was new environment for telco operator covering product, customer and fullfilment management. I cold not image how to design and develop it as monolithic. So it was implemented as microservices with UI. I would do exactly the same as you Robert. The thing is: how did you deal with CORS with Backend / FrontEnd, assuming that you were on a Cloud environnement ?